"Wind Ops" are a hot topic in the racing and riding press these days. The surgeries we commonly perform to correct acquired or congenital infirmities of the equine upper respiratory tract are frequently debated within the racing press, and when the betting public get involved in the discussion it's clear that there's a belief that these procedures are no longer seen as treating a disease rather giving a horse a performance advantage. My Father Jeffrey Brain MRCVS carried out his first wind op, a Hobday on a heavyweight show horse, in the late 1950's. He went on to pioneer the application of that procedure and several others in the racing world. Indeed he operated on the upper airways of 8 Cheltenham Gold Cup winners in the 60's and 70's. In those days it was not something people spoke about in the winners enclosure. We are now at a stage where the investigation of a "noise" or suspected upper airway disease has become very sophisticated. Dynamic "overland" endoscopes such as we use in our clinic allow us to film the upper respiratory tract whilst the horse exerts itself in a manner consistent with its job whether it be a sprinter, stayer or dressage horse. 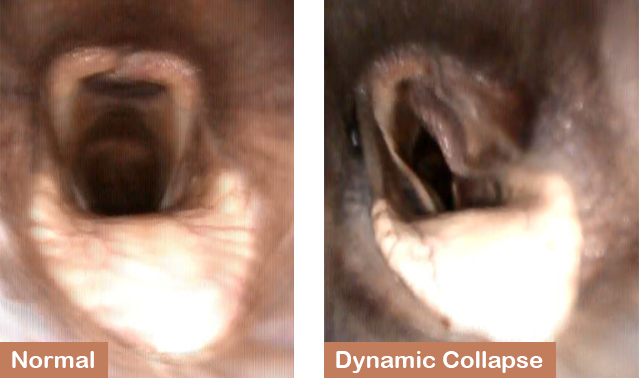 Dynamic endoscopy has been available for wind investigation for over 20 years. Originally this was performed on a tread mill which could be inclined to simulate an uphill gallop to test the patient as rigorously as possible. The very first overground scopes allowed a more realistic physical test to be performed with a jockey on board, unfortunately their image quality left a lot to be desired. Our current scope manufactured by Videomed in Germany allows pin sharp resolution with a 20 frame per second camera which is remotely controlled allowing us to view different areas of the respiratory tract whilst the horse is at full gallop. One of the most important lessons we have taken from the last 7 years of practice with the overland scope is that the type and manner of exercise must mimic as closely as possible the competition or race conditions during which the noise or loss of performance has been observed. This may sound obvious but as most racehorses are "interval" trained on a relatively short uphill gallop it is difficult to "get to the bottom" of a horse with regard to fatigue by repeatedly galloping up and then trotting down the same hill. For this reason we have our own circuit gallop at our clinic. This has a deep sand surface and allows exercise to progress continuously either with or without a lead horse upsides to keep the patient keen & competitive. The pace of the overland test is carefully overseen. Many of our patients only ever show evidence of a wind problem under the extreme duress at the latter stages of a race. 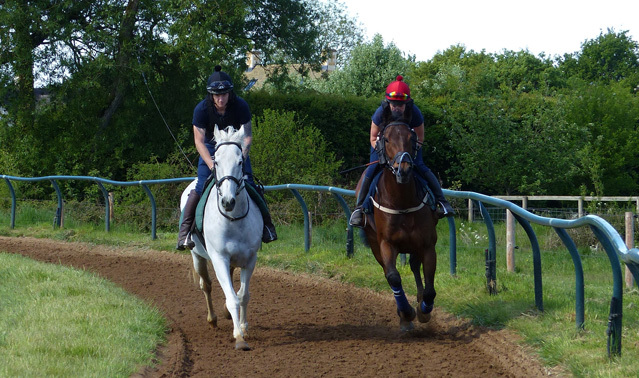 Our circuit is 2 furlongs (400m) around so we are careful to limit the pace to within what we feel is safe and will opt to go for an increased distance over outright pace. There are some occasions where the extreme speed and rapidity of breathing rate are the route of the problem so in such instances we tend to relocate locally to a straight gallop. With each patient that arrives at Dikler Farm for assessment we take great pains to reduce the risk of orthopaedic damage from such a rigorous test to a minimum. Our prime concern, especially when examining horses who have recently raced is the soundness of their limbs, in particular their flexor tendons. If we have any concerns we will opt to ultrasound scan the tendons prior to exercise (this is normally done free of charge as long as the horse progresses on to the gallop). The circulation and respiratory tract are intimately linked so we always make a cardiac assessment pre exercise and normally attach a remote ECG on the horse to monitor cardiac activity throughout the test. 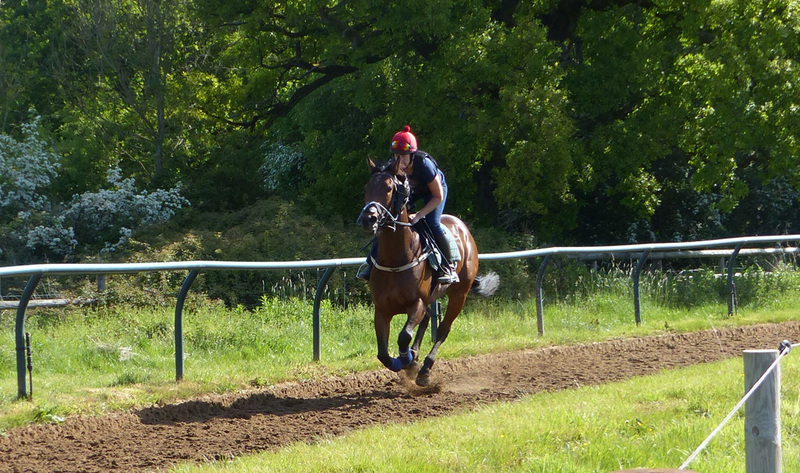 We have experienced jockeys on hand to ride upsides and set the pace and if necessary ride the patient being tested. Post exercise we put all our patients on a horse walker after being washed off to allow them to cool down safely, if we are concerned we'll leave the ECG heart monitor on as some cardiac arrhythmias are more identifiable during this recovery stage. Meanwhile this is the time when we sit down and analyse the video data recorded from the test, we encourage clients to sit with us during the diagnostic process and then a plan for treatment can be discussed. In most instances, if surgery is required then we can operate the same day and a large proportion of our case load will have gallop diagnosis and surgery and go home the same day. In many instances particularly if we cannot identify a significant cardiac or upper airway abnormality to explain a previous poor performance we will use a longer endoscope to examine the patients lower airway to check for problems such as bleeding, infection or other causes of inflammatory airway disease. Racing UK visits Brain Partners. Check out the video in Full HD at racinguk.com Please note this link will take you away from brainpartners.co.uk and we take no responsibility for the content on 3rd party sites. Video courtesy of Racing UK. Horses are asymmetrical, this is most significant when it comes to the anatomy of their larynx. The Recurrent Laryngeal Nerve which carries signals from the brain to the muscles of the larynx follows a dramatically looped route from the head to behind the heart and back to the larynx on the left side, the route of the righthand nerve is more direct. Hence we find the majority of larynx problems to be of the left hand side. Mild paralysis limited to the vocal cords results in a very typical whistle on the inspiratory phase of the breath.